Bavarian philosopher, theologian and alchemist. Wrote a paraphrase on ARISTOTLE and the Arabic comments on it. Responsible for a revival in Aristotelian thought. Albert of Cologne was the eldest son of the Count of Bollsaadt. 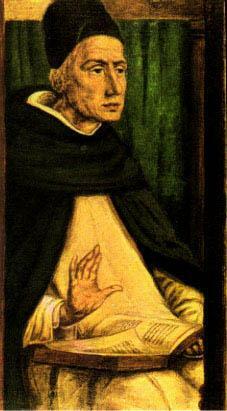 He studied in Padua and Paris, taught in Cologne and became a Dominican monk in 1223. He was made Bishop of Regensberg in 1260 but resigned two years later and spent the rest of his life teaching in Bavaria and the surrounding districts. He died in 1280, was beatified in 1622, canonized as St. Albert the Great in 1931, and in 1941 was declared patron saint of all who cultivate the natural sciences. 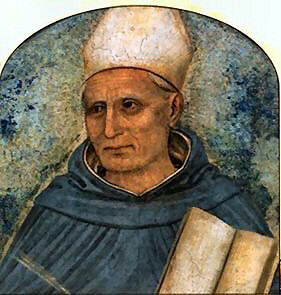 His fame is due in part to the fact that he was the forerunner, guide and teacher of St.Thomas Aquinas; but Albert of Cologne was known as Albertus Magnus even in his own lifetime because of his prolific scientific writings and his great influence on the study of philosophy and theology. His encyclopaedic compilation of all knowledge as understood at the time included his works Physica; Summa theologiae and De natura locorum and contained scientific treatises on alchemy, astronomy, mathematics, physiology, geography, economics, logic, rhetoric, ethics, politics, phrenology, metaphysics and all branches of natural science. Wrote on three realms of nature, De Animalibus, De Vegetablibus & De Mineralibus. Concluded that fossils were phenomena or ‘games of nature’. Compiled a list of Aristotle’s errors.